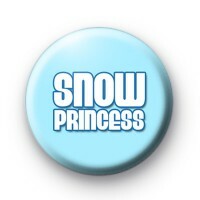 Pretty light blue Christmas themed badge with the Snow Princess written in white bubble lettering in the centre. Do you know someone that loves snow, skiing and all things Winter, then this is a cute badge for them. It is also a nice festive badge to pin to a Stockings or give as Christmas gifts. Make sure you take a look at our Christmas badge category as we have hundreds of holiday-themed badges to pick from.